Roses are a wonderful feature in a garden. With the right selection and right location, they can bring months of color and interest to your home. Whether you add roses to a mixed border, scramble a rose up a trellis, or create a parterre garden with dwarf boxwood edging, you'll find the results extremely satisfying. Afraid to plant roses because you fear the care will be too much? Have no fear! There are many new easy-care, disease resistant roses on the market and new non-toxic products for maintaining your roses. 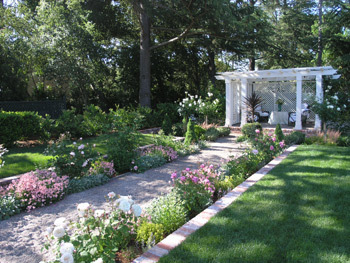 A formal, sunken rose garden in Atherton, California. Roses include, Gertrude Jekyll, Heritage, Iceberg and Tamora. Sally Holmes is making a home on the fence of this Lafayette home. 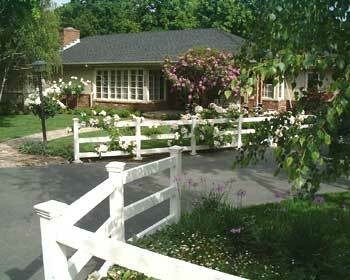 It creates a nice greeting and a barrier between the entrance and the driveway. This home in Burlingame had a small area next to the driveway. The homeowner wanted a myriad of different roses so we underplanted with Geranium 'Mavis Simpson' and Lamb's Ear to give the garden continuity. 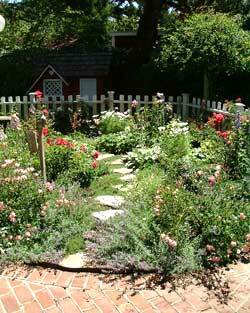 Here is another small area in a home in Atherton that succeeds as a rose garden. 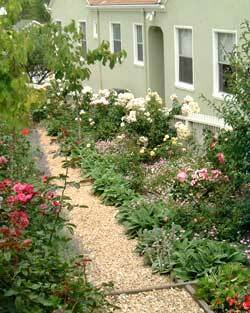 Because the area was so small, we included small shrub roses and underplanted with complimentary perennials. 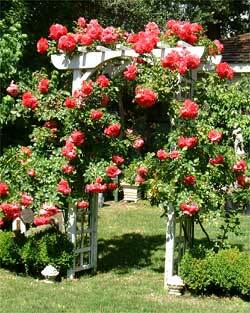 An arbor or trellis is a wonderful way to display a climbing rose, especially in a small garden. Rosa Uttersen is one of the most fragrant and prolific of all roses. 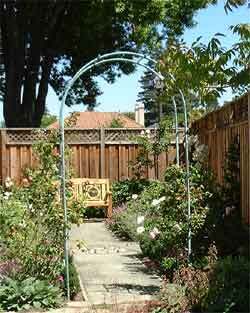 Rosa 'Eden Clilmber' will eventually cover this copper arbor of this small rose garden in Menlo Park.